The Jones family owns an office building at 70 Carrington Street which they recently decided to upgrade with a lift and accessible toilet. The changes mean the upstairs office space can now be accessed by all members of the community. “In this day and age, everyone should be looking to make things accessible,” Lyn Jones said. “It’s not only about people with disabilities but also people who have trouble with stairs, parents with prams, anyone with mobility issues, even people doing deliveries. Lyn had a close family member who needed to use a wheelchair in their old age, and she said it really opened her eyes. “It makes you suddenly aware of how tricky it is to get around,” she said. 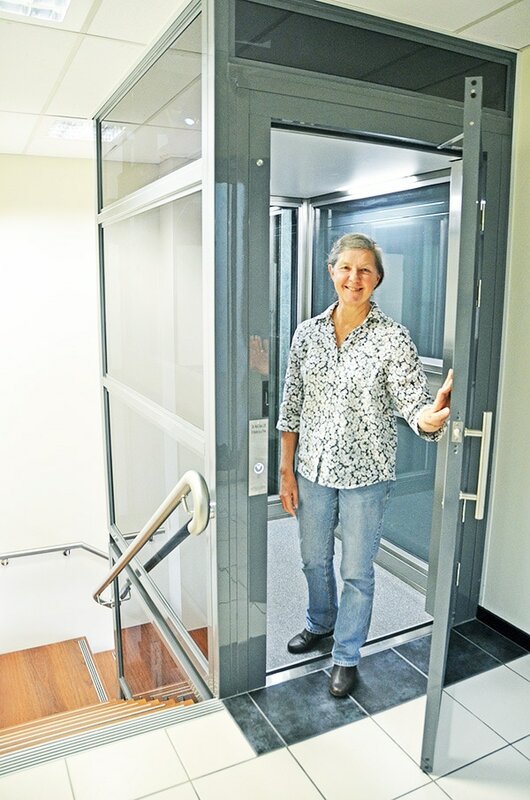 Lyn said the renovations took a little clever planning with tradespeople and the Australian lift manufacturer, who came up with smart ideas such as installing the electrics and hydraulics on the second floor in case of flood. Many businesses may also not be aware that by limiting accessibility, you can actually run the risk of losing customers. Lismore City Council has a simple one-page brochure, the Missed Business Guide, which helps businesses with hints, tips and simple ways to increase accessibility. Council will also waive any development application fees associated with works that directly improve accessibility. 2,422 people or 5.7% of the population in Lismore need assistance in their day-to-day lives due to disability. 12,271 or 28.7% of the Lismore population are over the age of 55 and may at some stage develop issues with mobility, sight and hearing. 2,620 or 6.1% of the Lismore population are four years and under and may require the use of a pram or stroller. “When you look at those numbers, you suddenly can see just how many potential customers you might be losing if your business is not accessible,” Council’s Economic Development Manager Tina Irish said. If you would like a copy of the Missed Business Guide or would like to discuss accessibility changes to your business, phone Economic Development Manager Tina Irish on 1300 87 83 87.